The relaunch of Spider-Man has been solid. After the low point of the series back in "One More Day", I quit reading the series. Around the time of "American Son" I returned to the series. "American Son" was a very good return to the type of story I expect in this book. Now Slott has been installed as the regular writer. 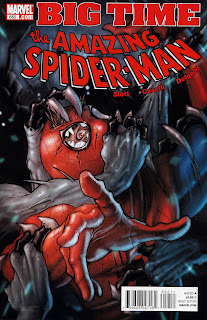 This issue features the start of a new story called "Revenge of the Spider-Slayer". The brains behind this scheme is Alistair Smythe, the son of the original Spider-Slayer. He blames J. Jonah Jameson for the death of his father. His plan for revenge consists of killing JJJ's son, wife, and father. JJJ will be helpless as he watches his loved ones die. He recruits others who hate JJJ to help him. This includes Mac Gargan, the original Scorpion. Slott shows that he knows how to handle Spider-Man's cast in the opening sequence. The combination of drama, humor, and patented bad Parker luck makes this feel like old home week on this title. I like that Slott is showing that Peter is a brain with his new job. Too often, writers forget that Peter is a genius. Smythe's invasion of the base is well planned. Peter is forced into action as Spider-Man when Smythe's plan is put into motion. The twist at the end is a good finish to this part of the story. Stefano Caselli's art is a mixture of a manga influenced style with occasional Mike McKone type faces. 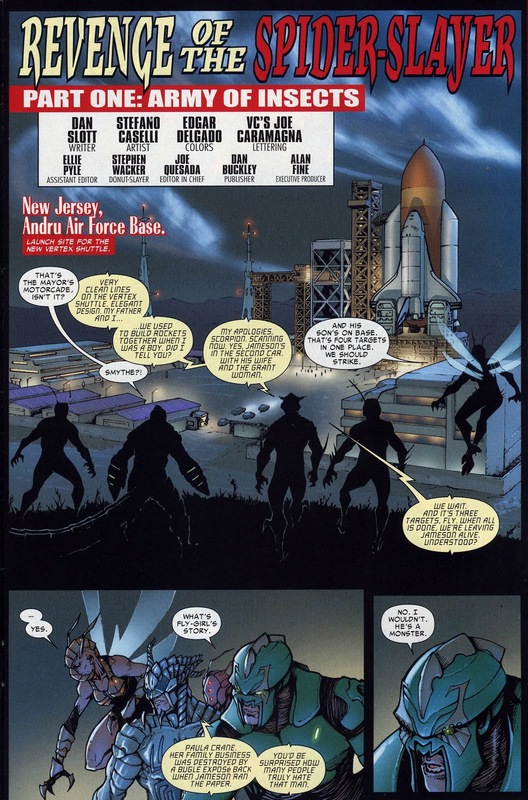 One of my favorite pages in this issue is the shot of the Smythe's insect army in silhouette as they approach Andru Air Force Base. The images show that the characters are not quite human. The design of the Fly shows a bizarre human/insect hybird. It is perfect for this character. If this is the new status quo for Spider-Man, I will continue to follow it.